The 1st Security Force Assistance Brigade (SFAB) has been officially established. It will soon be on its way to Afghanistan. The Army has needed a full-time, permanent advisor corps for a long time. Observers of the ad hoc advisory effort in Afghanistan and Iraq have pointed out the need for army advisor units. 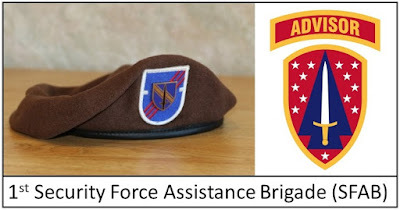 General Mark Milley, the Chief of Staff for the U.S. Army, announced in 2016 the proposed formation of six Security Force Assistance Brigades (SFABs). Certainly this is a move in the right direction. "1st SFAB hosts activation ceremony; Heraldry announced", Army.mil, February 8, 2018. "It's official: Army unveils brown beret, new patch for military advisors, SFAB", by Meghann Myers, Army Times, February 8, 2018. "Army's top general tells new Fort Benning unit they are 'marching into history'", Ledger-Enquirer, February 8, 2018. "Secretary of Defense James Mattis makes special trip to Fort Benning", Ledger-Enquirer, February 9, 2018. New SFAB Handgun. Some Problems? Some of the Army's units, including the 1st SFAB, are getting fielded the U.S. Army's Sig Sauer M17 Modular Handgun. Recent news reports have revealed some problems in its performance. Read "The Army is working to fix problems with its new handgun after critical DoD report", Army Times, February 1, 2018. Read "An Advise-and-Assist Commander Has Advice for the US Army's New Partner-Trainers", Defense One, February 6, 2018. Stakes are High for 1st SFAB. Dan Lamothe writes about the upcoming Afghan deployment for the 1st SFAB. About 800 Soldiers from the unit will go to Afghanistan along with a few hundred Soldiers from the Army's 3rd Infantry Division. "For this newly formed Army unit, the stakes in Afghanistan will be high", The Washington Post, February 8, 2018. See Institutionalizing Adaptation: It's Time for a Permanent Army Advisor Corps, by John A. Nagl, CNAS, June 27, 2007 and Learning From Our Mistakes in Selection and Training of Military Advisors, by John Friberg, SOFREP, January 14, 2016. See Advisory Brigades to be Established by U.S. Army, by John Friberg, SOFREP, June 29, 2016.